I was in Greece recently talking to two brothers about the situation there, and they presented Sweden as a utopia. Social democracy. It worked. Did it work? Could it work over a sustained period of time? How might you get some? One month later I was in Klaipėda, Lithuania, at Falling from grace, a contemporary Swedish art group show based on the hangover of post-social democracy. An exhibition expressing the fall towards a lower economic standard of living in Sweden. A fall from grace for whom? 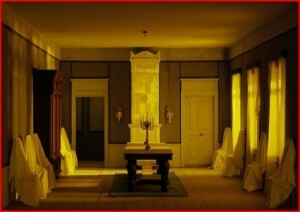 For the rest of us who wish we were there, symbolically if not in reality? Magnus Petersson’s series Sealed comprises photographs of scaled views of the Swedish family countryside home, a disappearing tradition. As models they present an ideal to aspire to. 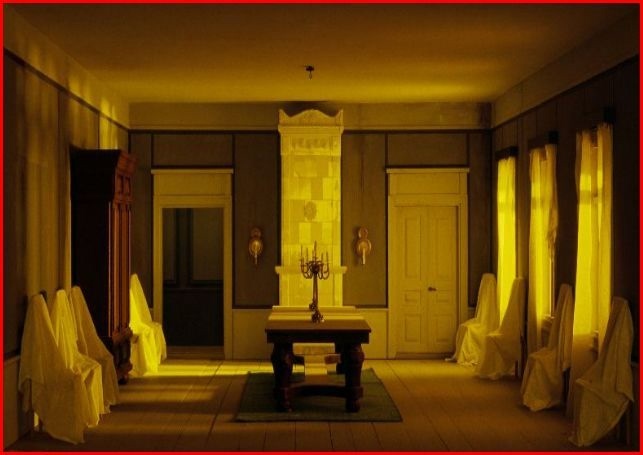 The rooms reflect a warm, soft, all-enveloping glow, which Petersson has referred to as ‘a soft Hammershoi or Tarkovsky-like afternoon glow’. Coming from the other side of the world, it felt like Vermeer—a glow from inside a house, warm and suggestive of a robust life unburdened by a harsh sun or thongs. Like all models, the images have a stillness to them, and this renders their time fixed, dead, historical. While I was drawn in by the glow and symmetry, I couldn’t help but feel like I missed the party. That I had come too late. 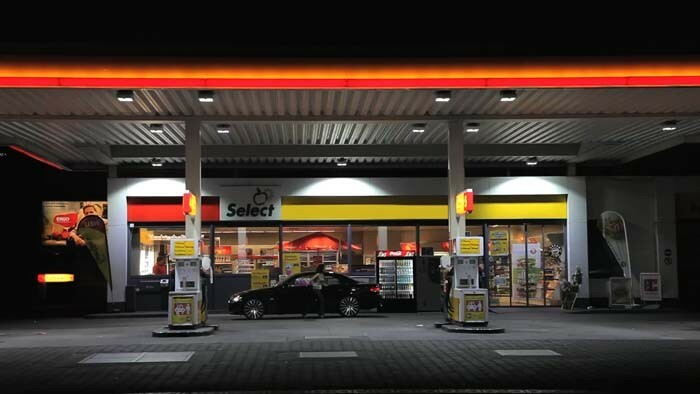 Ninia Sverdrup’s videos Urban scene XII: petrol station and Urban scene XIV: corner store, felt like an antidote to being too late. The work was slow. 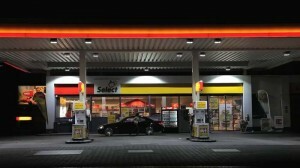 A fixed camera captured the happenings at a petrol station at night, a corner store during the day. The videos were based around ‘to have time for’, a luxury. The images had the slow plod of a moving Philip-Lorca diCorcia urban/suburban environment: nice light, easy life, boring possibly. So, while beautifully rendered, without the sound they seemed common and easy to pass by and dismiss, but once I put on the ear-phones, the sounds of these scenes began unfolding. I felt the push-pull of the tension of nothing but life happening. Certain sounds were heightened, not of conversations, but of the space, the creaks and moans of these urban environments. These scenes began to suggest that to have time (which is always a luxury), is to enable better hearing, better light and easier daily rituals. Kalle Brolin’s Images of debt, in contrast, was fast. So fast that the microfiche whirled in a blurred Citizen Kane-like flurry. Brolin presented a video-portrait of a child (Mattias Abrahamsson) who had been portrayed in a Swedish newspaper throughout his life up to adulthood as a metaphor for changing levels of national debt in Swedish society. In the style of Seven Up!, the video showed how each year the newspaper would show an image of Abrahamsson growing and a note showing the corresponding size of the national debt. Brolin contacted Abrahamsson and his video was interspersed with a running commentary of Abrahamsson’s experiences and present life. As each year rolled through, the microfiche whirled forward and you felt analogue time passing, a historical medium showing a lost time. Images of debt managed to capture the discomforting way in which economic circumstances can make us feel we are more statistical data than human beings. Seeing a young man discuss how at times he didn’t really want to have his photo taken, and how ‘they’ came into his home, I began to feel that I was seeing the crevices in a symbolic ideal. The fall. So, coming from Australia and knowing how I/we like things slow, I couldn’t help but wonder who we are. Are we Sweden, with a good social-democratic life and economic fortitude, or will we always aspire towards contemporary Europe and its diminishing middle class? In 2013, will we be the party or the hangover? And at what speed and in what light will we show our images? Falling from grace, Klaipėda Culture Communication Centre (KCCC), Lithuania, 18 January – 21 February 2013.